OBJECTIVES: To identify health care provider-related determinants of diabetes and hypertension management in patients attending public sector community health centres (CHCs). METHODS: A random sample of 18 CHCs in the Cape Peninsula providing hypertension and diabetes care was selected. Twenty-five patients with diabetes and 35 with hypertension per clinic were selected and interviewed by trained fieldworkers, and their medical records were audited. Regression analyses identified predictors of controlled hypertension (<140/90 mmHg) and diabetes (HbA1c <7%). In-depth interviews with nurses and doctors explored their experiences in working at the CHCs. Height, weight and blood pressure (BP) were measured for all patients and random blood samples collected for lipids, glucose, HbA1c and creatinine. RESULTS: Of the participants 923 had hypertension and 455 diabetes (289 had both conditions). Of the hypertensive patients 33% had a BP <140/90 mmHg, while 42% of the patients with diabetes had non-fasting glucose levels below 11.1 mmol/l. Patients' knowledge about their conditions was poor. Prescriptions for drugs were not recorded in medical records of 22.6% of the patients with diabetes and 11.4% of those with hypertension. CONCLUSIONS: Primary care for patients with hypertension and diabetes at public sector CHCs is suboptimal. This study highlights the urgent need to improve health care for patients with these conditions in public sector clinics in the Cape Peninsula. Most people with hypertension and diabetes in South Africa receive treatment in the public health care system, and in Cape Town they attend the community health centres (CHCs). These are known to have deficiencies in levels of care,4,5 with a high prevalence of unrecorded diabetic complications, suboptimal glycaemic and blood pressure (BP) control, 'routinised' care and polypharmacy.4 Despite improvements in frequency of BP measurement, follow-up and compliance, hypertension has been found to be uncontrolled in approximately 50% of patients.5 We surveyed patients with diabetes and those with hypertension attending CHCs to identify their treatment status and audited the clinic records to assess the recorded responses of health care providers in managing their patients. In-depth interviews with doctors and nurses investigated their experiences in working at the CHCs. The CHCs that provide primary health care in the Cape Peninsula can be reached easily by most patients and attendance is free of charge. Registered nurses and general medical practitioners (medical officers) provide the care and refer patients to secondary hospitals when required. Each medical officer (MO) manages between 40 and 70 patients per day. Medication from an essential drugs list is dispensed from a CHC pharmacy. During 1999, 18 of 35 possible CHCs in Cape Town were randomly selected for this cross-sectional study, and 35 patients with hypertension and 25 with diabetes were selected per clinic. Inclusion criteria were age 15 years or older, being a documented attendee at the particular CHC with at least four visits during the previous year for hypertension or diabetes, and having received treatment for these conditions at each visit. Participants who were unable to provide answers to a questionnaire, previously piloted and translated into Afrikaans and isiXhosa, were excluded. Ten open and flexible in-depth interviews were conducted in private with nurses and doctors purposefully sampled from six of the participating clinics. These allowed respondents to explore issues in their own terms and raise other topics for discussion. Data were coded and computerised, and analyses provided descriptive statistics of the study population. Of the 1 089 participants, 923 were hypertensive and 455 were diabetic (289 had both conditions); most (78.8%) were women. Their mean age was 60.3±11.1 years, more than half were pensioners or received a disability grant, and only about 20% were employed. About half the participants had either primary school or no education. The survey data showed poor levels of hypertension and diabetes control (Table I). Of the patients with hypertension 67.2% had a BP of >140/90 mmHg, and 76.1% of those with diabetes had BPs above the recommended cut-off point of 130/85 mmHg. Furthermore, 76% of patients with diabetes had HbA1c levels >1% above the upper limit of normal (5.9%). Associated risk factors were poorly controlled, e.g. about 70% of the participants had a total cholesterol (TC) level above the cut-off point of 5 mmol/l (Table II). Patients had little knowledge about their chronic condition. Of the hypertensive patients 63% knew that their condition causes stroke, but knowledge about the consequences of untreated hypertension was otherwise poor, and less than 1% knew that renal failure could result from poor treatment. Diabetes patients had little understanding of how to manage hyper- or hypoglycaemia and inadequate knowledge of the impact of poor diabetes control. About 80% of patients said that they took their medication as prescribed. However, only 66.2% and 74% of patients with hypertension and diabetes, respectively, had taken their medication on the morning of their clinic visit. Unhealthy lifestyles were common, with just over 20% smoking at least one cigarette a day. Of those who had ever smoked daily, about a third had tried to quit smoking and most had started smoking again. Medical records revealed that poor BP and blood glucose control tended to be of long standing. 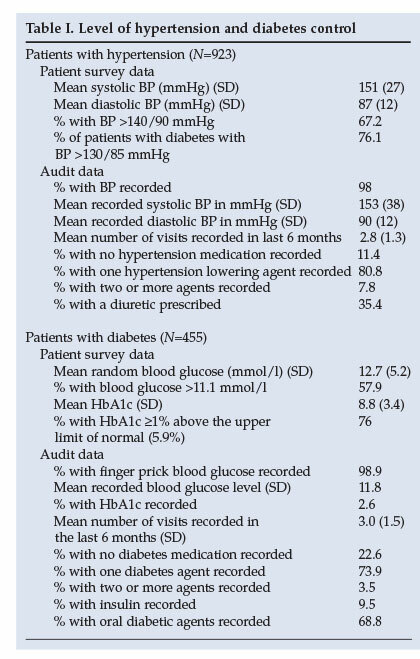 BPs and blood glucose were recorded for 98% of the patients (Table I), and the records reflected few aspects of good hypertension and diabetes care and follow-up. Co-morbid conditions, special investigations and clinical signs of target organ damage were seldom noted; for example only 11.3% of patients with diabetes had a record of examination of their feet, and only 2.6% had a record of HbA1c measurements. Drug prescriptions were not recorded in 22.6% and 11.4% of the diabetes and hypertensive patient records, respectively, while 73.9% of patients with diabetes and 80.8% of those with hypertension had one appropriate drug recorded for their condition. Of the patients with diabetes 9.5% used insulin and 68.8% oral anti-diabetic agents. Of the patients with hypertension only 35.4% used diuretics, 13% angiotensin-converting enzyme (ACE) inhibitors, 11% beta-blockers and 6% reserpine and methyldopa. Medication for other chronic conditions was recorded in about 10% of patients in both groups, while less than 0.5% were prescribed cholesterol-lowering drugs. When comparing the BP and HbA1c levels along with those levels that are controlled in patients attending CHCs with and without dedicated hypertension or diabetes clinics, no significant differences were observed after adjusting for the clustering effect of the sample. 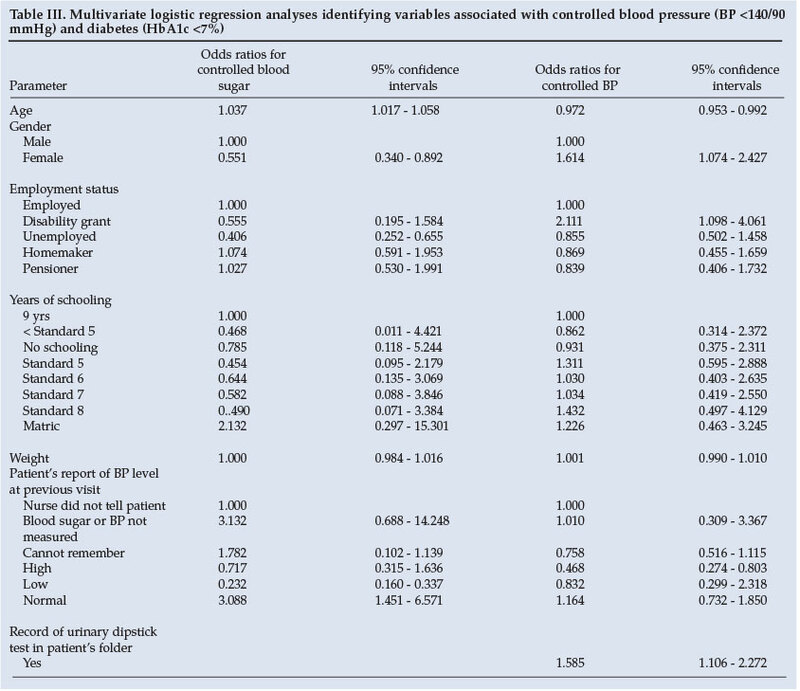 However, a simple univariate analysis showed that patients attending dedicated hypertension clinics at CHCs had significantly lower systolic BP levels (6.7 mmHg, p<0.05) than those who did not attend such clinics. Adjusting for the clustering effect of the CHCs, the comparison was not significant (p=0.101). 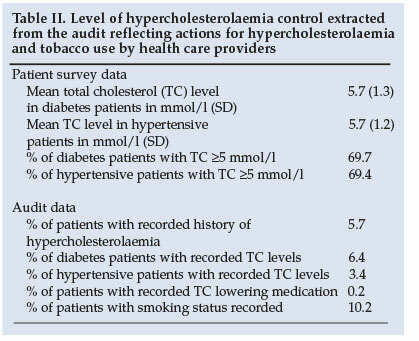 Results of the multivariate regression analyses, after adjustment for the clustering in CHCs used to identify the predictors of controlled hypertension and diabetes among patients whose BP and HbA1c levels were below 140/90 mHg and 7% respectively, are shown in Table III. Older hypertensives and men had significantly poorer BP control; patients receiving a disability grant had better BP control than those who were employed; and those reporting a higher BP at the previous visit had significantly poorer BP control. Patients with a urinary dipstick measurement had significantly poorer BP control than those without such recordings. Major themes that emerged from analysis of the in-depth interviews included that doctors and nurses were working under increasingly difficult circumstances; staff shortages were the main barriers to effectively managing patients with diabetes and hypertension; the complexity of cases previously managed by specialists at tertiary hospitals was of concern; and there was much dissatisfaction at the lack of financial resources to conduct special investigations. All respondents felt angry and frustrated about their work situation. The longstanding poor control of chronic diseases by despondent health care providers in CHCs evident from previous smaller studies3-5 is confirmed by the 1999 data. There was no improvement in the treatment of hypertension and diabetes, despite the institution of consensus-based guidelines for their management in public sector CHCs. These were publicised and widely disseminated by the Western Cape Department of Health in 1996. Patients were not actively involved in their own care and provision had to be made for large numbers of patients at the CHCs. The situation was severely strained because of limited resources and failure to plan for the large number of patients shifted from secondary and tertiary levels of care. This study shows that the people who attend public sector CHCs in Cape Town for treatment of hypertension and diabetes are not 'informed activated patients' and that health care provider inertia is rife. This finding should not be surprising given our political history, which demanded passivity of the poor and disenfranchised. The authoritarian style of health care providers and the lack of culturally appropriate health-promotion tools to support patients in effective self-management contribute to this situation. An evaluation of the self-care patterns among white, black and coloured South Africans found marked culturally linked differences16 and concluded that a uniform self-care development programme for all South Africa's groups is not viable. Guidelines for supporting self-management skills tailored to the cultural backgrounds of patients with chronic disease emphasise communication between relevant role players.17,18 Patient behaviours identified for long-term BP control for hypertension were that patients must: (i) personally decide to control their BP; (ii) take their medication as prescribed; (iii) monitor their progress towards their BP goal; and (iv) personally decide on actions to resolve the problems preventing achievement of BP control.19 Studying and understanding the knowledge base, skills, cultural understanding and attitudinal elements that underpin each of these required behaviours are essential,19 including the patient's perception of the psychological and logistic barriers to adherence to chronic disease care. Only then can participatory decision making programmes be developed to enhance self-care skills in patients. The development and implementation of culturally appropriate, effective patient self-care programmes for all South African groups are essential to improve health care delivery for patients with hypertension and diabetes. CHCs with dedicated chronic disease clinics were closer to the proposed patient-centred approach and were run by trained nurse clinicians supported by an MO. Careful study of this model is needed so that it can be implemented at CHCs across the country. The role of trained community health workers linked to such clinics and patient empowerment initiatives, including examining the usefulness of CHC or community patient support groups, needs to be explored. Drug delivery systems ensuring the availability of chronic disease drugs at all times are required. Providing chronic drugs for only 1 month for stabilised patients should be re-examined as this results in unnecessary visits to CHCs with increased demands on nurses and pharmacists. The Healthcare 2010 Plan of the Western Cape addresses many of the factors influencing poor chronic disease care (www.capegateway.gov.za). It emphasises the development of a previously non-existent community-based service delivery platform. Strengthening this level of service delivery should reduce pressure experienced at the primary health facilities. Although services at this platform will be rendered mainly by community health workers, they will be funded, trained and performance managed by managers based at district and sub-district offices of the health department. It is intended that empowering and supporting communities to take greater responsibility in the provision of their health needs will improve outcomes, particularly for those with chronic diseases. Furthermore, the Western Cape is formulating a strategic plan to address chronic diseases. These proposed community-based platforms using trained community health workers to run support groups in the community for patients with chronic conditions in close collaboration with the health care providers based at the CHCs should improve the care for patients with chronic conditions. Furthermore, the pressure on the CHC-based health care providers and the health care provider inertia that was so prominent in 1999 will be reduced.